Flip straw lid and leak-proof twist-on cap. Wide mouth makes the bottle simple to fill. The rubber inspirational wristbands can be removed for wearing, and readily replaced for 'grip'. 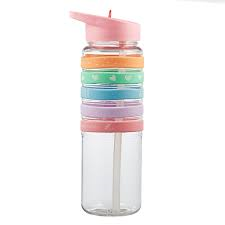 Bottle, lid and straw are BPA free, food grade safe plastic. Hand Wash Only - Not Suitable For Hot Beverages.